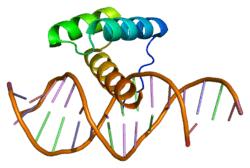 Msh homeobox 1, also known as MSX1, is a protein that in humans is encoded by the MSX1 gene. MSX1 transcripts are not only found in thyrotrope-derived TSH cells, but also in the TtT97 thyrotropic tumor, which is a well differentiated hyperplastic tissue that produces both TSHß- and a-subunits and is responsive to thyroid hormone. MSX1 is also expressed in highly differentiated pituitary cells which until recently was thought to be expressed exclusively during embryogenesis. There is a highly conserved structural organization of the members of the MSX family of genes and their abundant expression at sites of inductive cell–cell interactions in the embryo suggest that they have a pivotal role during early development. This gene encodes a member of the muscle segment homeobox gene family. The encoded protein functions as a transcriptional repressor during embryogenesis through interactions with components of the core transcription complex and other homeoproteins. It may also have roles in limb-pattern formation, craniofacial development, in particular, odontogenesis, and tumor growth inhibition. There is also strong evidence from sequencing studies of candidate genes involved in clefting that mutations in the MSX1 gene may be associated in the pathogenesis of cleft lip and palate. Mutations in this gene, which was once known as homeobox 7, have also been associated with Witkop syndrome, Wolf-Hirschhorn syndrome, and autosomal dominant hypodontia. Haploinsufficiency of MSX1 protein affects the development of all teeth, preferentially third molars and second premolars. The effect of haploinsufficiency of PAX9 on the development of incisors and premolars is probably caused by a deficiency of MSX1 protein. Phenotypes caused by deficiency of MSX1 protein might depend on the localization of mutations and their effect on the protein structure and function. Two substitution mutations, Arg196Pro and Met61Lys cause only familial non-syndromic tooth agenesis. Frameshift mutations, Ser202Stop mutation, resulting in a protein that lacks the C-terminal end of the homeodomain, impairs not only teeth but also nail formation, while Ser105Stop mutation, causing complete absence of the MSX1 homeodomain, is responsible for the most severe phenotype, which includes orofacial clefts with accompanied tooth agenesis. MSX1 is one of the strongest candidate genes for specific forms of tooth agenesis, mutations in this gene was detected only in some affected individuals. Genes expressed in the early dental epithelium in mice such as Bmp4, Bmp7, Dlx2, Dlx5, Fgf1, Fgf2, Fgf4, Fgf8, Lef1, Gli2, and Gli3 are also potential candidates. Based on existing evidence, it seems possible that both hypodontia and oligodontia are heterogeneous traits, caused by several independent defective genes, which act along or in combination with other genes and lead to specific phenotypes. MSX1 is found to have a linkage with Witkop syndrome, also known as “tooth and nail syndrome” or “nail dysgenesis and hypodontia” since mutations in MSX1 were shown to be associated with tooth agenesis. There is a linkage found between TNS and markers surrounding the MSX1 locus and it showed that a nonsense mutation (S202X) in MSX1 cosegregated with the TNS phenotype in a three-generation family. MSX1 has been shown to interact with DLX5, CREB binding protein, Sp1 transcription factor, DLX2, TATA binding protein and Msh homeobox 2. LHX2, a LIMtype homeoprotein, is a protein partner for MSX1 in vitro and in cellular extracts. The interaction between MSX1 and LHX2 is mediated through the homeodomain-containing regions of both proteins. MSX1 and LHX2 form a protein complex in the absence of DNA, and that DNA binding by either protein alone can occur at the expense of protein complex formation. ↑ Hewitt JE, Clark LN, Ivens A, Williamson R (Nov 1991). "Structure and sequence of the human homeobox gene HOX7". Genomics. 11 (3): 670–8. doi:10.1016/0888-7543(91)90074-O. PMID 1685479. ↑ Sarapura VD, Strouth HL, Gordon DF, Wood WM, Ridgway EC (Nov 1997). "Msx1 is present in thyrotropic cells and binds to a consensus site on the glycoprotein hormone alpha-subunit promoter". Molecular Endocrinology. 11 (12): 1782–94. doi:10.1210/me.11.12.1782. PMID 9369446. 1 2 3 4 Shetty S, Takahashi T, Matsui H, Ayengar R, Raghow R (May 1999). "Transcriptional autorepression of Msx1 gene is mediated by interactions of Msx1 protein with a multi-protein transcriptional complex containing TATA-binding protein, Sp1 and cAMP-response-element-binding protein-binding protein (CBP/p300)". The Biochemical Journal. 339 (3): 751–8. doi:10.1042/0264-6021:3390751. PMC 1220213 . PMID 10215616. ↑ Dixon MJ, Marazita ML, Beaty TH, Murray JC (Mar 2011). "Cleft lip and palate: understanding genetic and environmental influences". Nature Reviews. Genetics. 12 (3): 167–78. doi:10.1038/nrg2933. PMC 3086810 . PMID 21331089. ↑ van den Boogaard MJ, Dorland M, Beemer FA, van Amstel HK (Apr 2000). "MSX1 mutation is associated with orofacial clefting and tooth agenesis in humans". Nature Genetics. 24 (4): 342–3. doi:10.1038/74155. PMID 10742093. ↑ Jezewski PA, Vieira AR, Nishimura C, Ludwig B, Johnson M, O'Brien SE, Daack-Hirsch S, Schultz RE, Weber A, Nepomucena B, Romitti PA, Christensen K, Orioli IM, Castilla EE, Machida J, Natsume N, Murray JC (Jun 2003). "Complete sequencing shows a role for MSX1 in non-syndromic cleft lip and palate". Journal of Medical Genetics. 40 (6): 399–407. doi:10.1136/jmg.40.6.399. PMC 1735501 . PMID 12807959. ↑ Suzuki Y, Jezewski PA, Machida J, Watanabe Y, Shi M, Cooper ME, Viet le T, Nguyen TD, Hai H, Natsume N, Shimozato K, Marazita ML, Murray JC (2004). "In a Vietnamese population, MSX1 variants contribute to cleft lip and palate". Genetics in Medicine. 6 (3): 117–25. doi:10.1097/01.GIM.0000127275.52925.05. PMID 15354328. ↑ "Entrez Gene: MSX1 msh homeobox 1". 1 2 3 Mostowska A, Kobielak A, Trzeciak WH (Oct 2003). "Molecular basis of non-syndromic tooth agenesis: mutations of MSX1 and PAX9 reflect their role in patterning human dentition". European Journal of Oral Sciences. 111 (5): 365–70. doi:10.1034/j.1600-0722.2003.00069.x. PMID 12974677. ↑ Jumlongras D, Bei M, Stimson JM, Wang WF, DePalma SR, Seidman CE, Felbor U, Maas R, Seidman JG, Olsen BR (Jul 2001). "A nonsense mutation in MSX1 causes Witkop syndrome". American Journal of Human Genetics. 69 (1): 67–74. doi:10.1086/321271. PMC 1226049 . PMID 11369996. 1 2 3 4 Zhang H, Hu G, Wang H, Sciavolino P, Iler N, Shen MM, Abate-Shen C (May 1997). "Heterodimerization of Msx and Dlx homeoproteins results in functional antagonism". Molecular and Cellular Biology. 17 (5): 2920–32. doi:10.1128/mcb.17.5.2920. PMC 232144 . PMID 9111364. ↑ Zhang H, Catron KM, Abate-Shen C (Mar 1996). "A role for the Msx-1 homeodomain in transcriptional regulation: residues in the N-terminal arm mediate TATA binding protein interaction and transcriptional repression". Proceedings of the National Academy of Sciences of the United States of America. 93 (5): 1764–9. doi:10.1073/pnas.93.5.1764. PMC 39855 . PMID 8700832. ↑ Bendall AJ, Rincón-Limas DE, Botas J, Abate-Shen C (Jul 1998). "Protein complex formation between Msx1 and Lhx2 homeoproteins is incompatible with DNA binding activity". Differentiation; Research in Biological Diversity. 63 (3): 151–7. doi:10.1046/j.1432-0436.1998.6330151.x. PMID 9697309. Mostowska A, Kobielak A, Trzeciak WH (Oct 2003). "Molecular basis of non-syndromic tooth agenesis: mutations of MSX1 and PAX9 reflect their role in patterning human dentition". European Journal of Oral Sciences. 111 (5): 365–70. doi:10.1034/j.1600-0722.2003.00069.x. PMID 12974677. Padanilam BJ, Stadler HS, Mills KA, McLeod LB, Solursh M, Lee B, Ramirez F, Buetow KH, Murray JC (Sep 1992). "Characterization of the human HOX 7 cDNA and identification of polymorphic markers". Human Molecular Genetics. 1 (6): 407–10. doi:10.1093/hmg/1.6.407. PMID 1284527. Hewitt JE, Clark LN, Ivens A, Williamson R (Nov 1991). "Structure and sequence of the human homeobox gene HOX7". Genomics. 11 (3): 670–8. doi:10.1016/0888-7543(91)90074-O. PMID 1685479. Ivens A, Flavin N, Williamson R, Dixon M, Bates G, Buckingham M, Robert B (Apr 1990). "The human homeobox gene HOX7 maps to chromosome 4p16.1 and may be implicated in Wolf-Hirschhorn syndrome". Human Genetics. 84 (5): 473–6. doi:10.1007/BF00195823. PMID 1969845. McAlpine PJ, Shows TB (Jul 1990). "Nomenclature for human homeobox genes". Genomics. 7 (3): 460. doi:10.1016/0888-7543(90)90186-X. PMID 1973146. Robert B, Sassoon D, Jacq B, Gehring W, Buckingham M (Jan 1989). "Hox-7, a mouse homeobox gene with a novel pattern of expression during embryogenesis". The EMBO Journal. 8 (1): 91–100. PMC 400776 . PMID 2565810. Vastardis H, Karimbux N, Guthua SW, Seidman JG, Seidman CE (Aug 1996). "A human MSX1 homeodomain missense mutation causes selective tooth agenesis". Nature Genetics. 13 (4): 417–21. doi:10.1038/ng0896-417. PMID 8696335. Zhang H, Catron KM, Abate-Shen C (Mar 1996). "A role for the Msx-1 homeodomain in transcriptional regulation: residues in the N-terminal arm mediate TATA binding protein interaction and transcriptional repression". Proceedings of the National Academy of Sciences of the United States of America. 93 (5): 1764–9. doi:10.1073/pnas.93.5.1764. PMC 39855 . PMID 8700832. Zhang H, Hu G, Wang H, Sciavolino P, Iler N, Shen MM, Abate-Shen C (May 1997). "Heterodimerization of Msx and Dlx homeoproteins results in functional antagonism". Molecular and Cellular Biology. 17 (5): 2920–32. doi:10.1128/mcb.17.5.2920. PMC 232144 . PMID 9111364. Sarapura VD, Strouth HL, Gordon DF, Wood WM, Ridgway EC (Nov 1997). "Msx1 is present in thyrotropic cells and binds to a consensus site on the glycoprotein hormone alpha-subunit promoter". Molecular Endocrinology. 11 (12): 1782–94. doi:10.1210/me.11.12.1782. PMID 9369446. Bendall AJ, Rincón-Limas DE, Botas J, Abate-Shen C (Jul 1998). "Protein complex formation between Msx1 and Lhx2 homeoproteins is incompatible with DNA binding activity". Differentiation; Research in Biological Diversity. 63 (3): 151–7. doi:10.1046/j.1432-0436.1998.6330151.x. PMID 9697309. Shetty S, Takahashi T, Matsui H, Ayengar R, Raghow R (May 1999). "Transcriptional autorepression of Msx1 gene is mediated by interactions of Msx1 protein with a multi-protein transcriptional complex containing TATA-binding protein, Sp1 and cAMP-response-element-binding protein-binding protein (CBP/p300)". The Biochemical Journal. 339 (3): 751–8. doi:10.1042/0264-6021:3390751. PMC 1220213 . PMID 10215616. Bendall AJ, Ding J, Hu G, Shen MM, Abate-Shen C (Nov 1999). "Msx1 antagonizes the myogenic activity of Pax3 in migrating limb muscle precursors". Development. 126 (22): 4965–76. PMID 10529415.
van den Boogaard MJ, Dorland M, Beemer FA, van Amstel HK (Apr 2000). "MSX1 mutation is associated with orofacial clefting and tooth agenesis in humans". Nature Genetics. 24 (4): 342–3. doi:10.1038/74155. PMID 10742093. Benzing T, Yaffe MB, Arnould T, Sellin L, Schermer B, Schilling B, Schreiber R, Kunzelmann K, Leparc GG, Kim E, Walz G (Sep 2000). "14-3-3 interacts with regulator of G protein signaling proteins and modulates their activity". The Journal of Biological Chemistry. 275 (36): 28167–72. doi:10.1074/jbc.M002905200. PMID 10862767. Mehra-Chaudhary R, Matsui H, Raghow R (Jan 2001). "Msx3 protein recruits histone deacetylase to down-regulate the Msx1 promoter". The Biochemical Journal. 353 (Pt 1): 13–22. doi:10.1042/0264-6021:3530013. PMC 1221538 . PMID 11115394. Jumlongras D, Bei M, Stimson JM, Wang WF, DePalma SR, Seidman CE, Felbor U, Maas R, Seidman JG, Olsen BR (Jul 2001). "A nonsense mutation in MSX1 causes Witkop syndrome". American Journal of Human Genetics. 69 (1): 67–74. doi:10.1086/321271. PMC 1226049 . PMID 11369996. Blin-Wakkach C, Lezot F, Ghoul-Mazgar S, Hotton D, Monteiro S, Teillaud C, Pibouin L, Orestes-Cardoso S, Papagerakis P, Macdougall M, Robert B, Berdal A (Jun 2001). "Endogenous Msx1 antisense transcript: in vivo and in vitro evidences, structure, and potential involvement in skeleton development in mammals". Proceedings of the National Academy of Sciences of the United States of America. 98 (13): 7336–41. doi:10.1073/pnas.131497098. PMC 34669 . PMID 11390985. Lidral AC, Reising BC (Apr 2002). "The role of MSX1 in human tooth agenesis". Journal of Dental Research. 81 (4): 274–8. doi:10.1177/154405910208100410. PMC 2731714 . PMID 12097313. MSX1 human gene location in the UCSC Genome Browser. MSX1 human gene details in the UCSC Genome Browser.